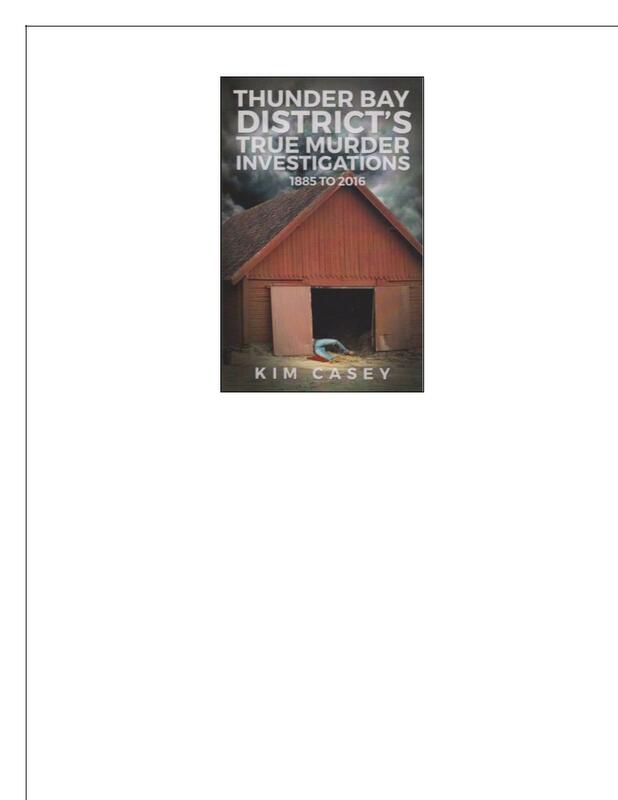 Kim Casey is the author of five books, including Thunder Bay District’s True Murder Investigations 1885 to 2016 and Thunder Bay City’s True Murder Investigations 1882 – 2014. Her books are self-published through her publishing house, Ahneen Publishing. Casey will be at Brodie on Wednesday, April 4th to talk about Thunder Bay District’s True Murder Investigations 1885-2016. Shauna Kosoris: What was the inspiration for your newest book, Thunder Bay District’s True Murder Investigations 1885 – 2016? Kim Casey: While I was working on the Thunder Bay City’s True Murder Investigations book, I came across a lot of information about murder cases that occurred in the District. And due to their being so many, I thought it might make an informative book. What was the most interesting fact you came across while researching the book? In several of the murder cases, the accused claimed that they took another person’s life because they were defending themselves. And I was really surprised by some of the decisions made by jurors when it came to this defense. Your last few books have been nonfiction, but prior to that you wrote some fiction books. Do you have a preference for writing fiction or nonfiction? I prefer nonfiction because it appeals to my insatiable search for truth. Do you have any plans to go back to writing fiction? I have no plans to write any more fiction. So what drove you to create your own publishing house, Ahneen Publishing? In the early years of my writing, I would send my manuscripts out to publishers. Most of them flat out rejected them with a patronizing form letter. There were some rare occasions where a publisher would show an interest in my work. One even offered me a book deal, than abruptly changed her mind. It got to be quite a frustrating and depressing process. So I was left with two choices. Walk away from writing or do it myself. I was leaning strongly towards the former but my dear partner Jon, kept encouraging me to continue. His belief in my ability to write, propelled me to self-publish. The reason I call it Ahneen is to pay tribute to my partner and his aboriginal heritage. It means hello in Cree. Jon was taught that life isn’t about the amassing of money and possessions. It’s about living your truth and doing it in a way that is respectful of others and the universe. I am revising the Thunder City’s True Murder Investigations book. I had no intention of doing this but when I was completing the book on the District, I came across more information on city murders. Particularly on cases from the past, that I don’t think are very well known. So I decided to update it, it should be done by early spring. Once the book is done, I will not update it again. There are so many authors and books that have inspired and influenced me. But the key ones are Margaret Laurence’s The Diviners, John Steinback’s Cannery Row, and Truman Capote’s In Cold Blood. Right now, I am reading a book written by a writer from Manitouwadge. It’s called The Dead of Winter and it’s about the double-murder that occurred at the Antelope Mine, outside of Schreiber. Judy Sencza is the author and her father knew one of the victims. It’s a good read. Great interview as usual Shauna. I am delighted that she will be speaking at Brodie. I re posted in my blog Literary Thunder Bay. Loved the two books.